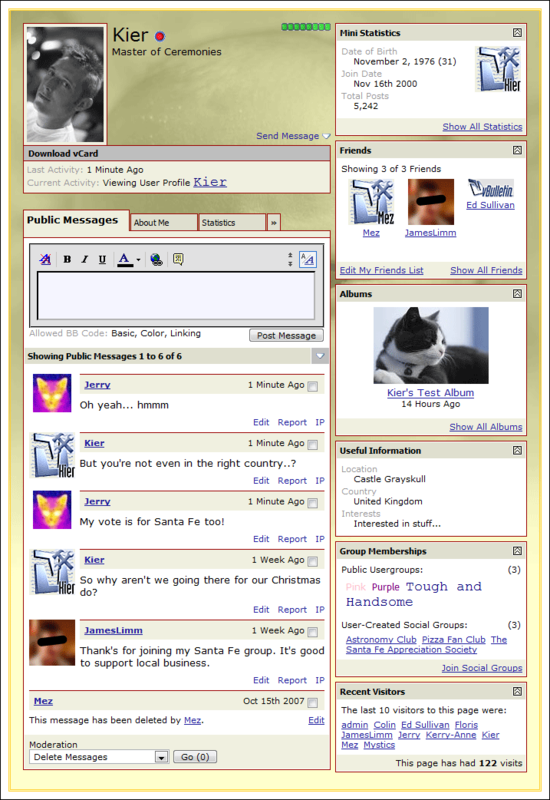 Paw Talk - Pet Forums > Forum Information > Forum News > Welcome to the improved PT! Uh-oh, right? No, no worries! Things have gone pretty smoothly and we have a whole host of new features for you to enjoy on PT! Go take a peek at your profile (or click on mine). Pretty cool, huh? You're now able to customize the look of them (example) and as you may have noticed, we are also adding social networking type options to PT. (Think MySpace but on Paw-Talk!) You can add friends, create social groups (i.e. a group for rats, rabbits, etc. ), leave public messages on profiles (like comments on MySpace), create your own photo albums and upload photos with options for privacy settings, track who's viewed your profile, and more. We've also added options for Social Bookmarking, added the ChatBox to all threads, enabled additional SPAM protection, added options for thread prefixes (coming soon), thread tagging, enhanced 'lightbox' style attachment viewing coming soon, and more behind the scenes updates to help keep the forum running smoothly! I'm headed out of town tomorrow until the 15th so I won't be around but as soon as I get back, we'll get some of the additional features up and running. In the meantime, play around and enjoy the new options! Please PM papabeten if you notice a technical problem or post here with questions. Last edited by Jade; 05-05-2008 at 01:18 PM. Stephanie, This is cool, how do I upgrade? Charlene, the whole forum was upgraded, you don't have to do anything additional. Go click around in your UserCP and check out your new options. Im off to take a look at it now! I'm such a goof ball! I figured it out as soon as I posted you a note! I am having a BLAST! Almost as fun as changing my Avatars around. I haven't gotten one thing done today except play with the computer. Heh heh. Absolutely loving it so far. Waaahoooey!! Yessssssssss, I need something to help me waste time for the next few weeks. This is going to help immensely. haha, lol, this is awesome! I loved paw-talk the way it was, ... and now it's even better? WOW, thanks PT! Great, another way to procrastinate . Pretty nice, Jade! High-Tech PT! sweeeeeeet new features! this is fuuuun. thanks for upgrading! I am having so much fun with this new stuff!! Just wanted to post a little glitch here...I did pm papa about it. When your on a profile page and looking at the top right you will see the mini statistic box there also is "view all statistics" to click on at the bottom of that box. Well, when you click on that you only get a view for about a split second. After that I get a message telling me that the webcage cannot be found. I take it that these statistics is where we can see what each member has for pets as well as other things they have listed about themselves...there location, etc.